Back in December, I started cutting circles. Dozens and dozens of tiny circles that made up half tone images of money. I cut out the easy one first: Tom Jefferson off of the $2 bill. I took the other two to South Carolina and managed to cut out the buffalo off of the buffalo nickle. My sister and niece helped cut a few dozen of the circles out. The last piece proved to test my bounds of sanity as well as a cramped index finger. I finally cut out the liberty head half dollar a few weeks ago. 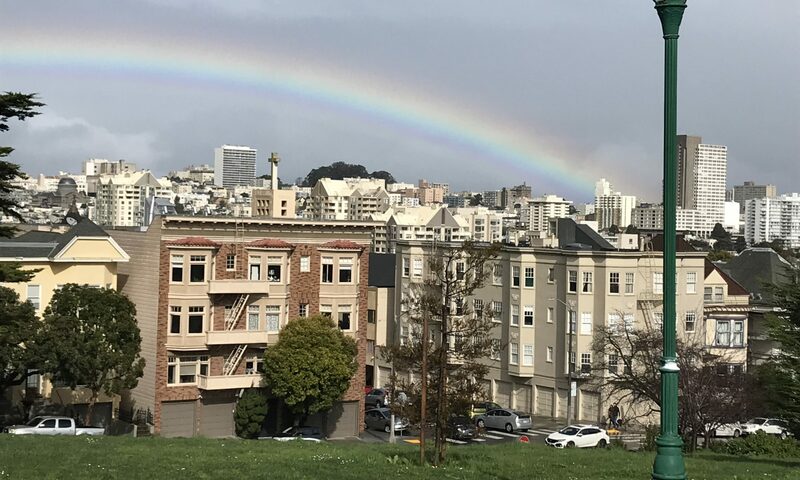 All the while Todd Hanson has been holed up in his rotting Noe Valley bungalow madly cutting anything that comes to mind. He’s only been cutting stencils for a year or so but has already become a master at it. He practices on magazine ads but has begun to really just cut what he imagines. So he has developed a truly unique style that I like very much. Sabrina Enrique from Density on Valencia St. emailed me months ago asking about my having a show at her store. She started selling my book too. I had to include Todd. We met Sabrina at her store and talked about the Mission, art, and stencils. She had a great Michael Kushner show up when we stopped by. After agreeing to set up an exhibit, Todd and I both kept asking Scott Williams, the SF king of cut paper, to be part of the show. He finally relented. So as the show loomed, I had to think up a name that wasn’t a lame stencil cliche. Todd and I began to throw ideas around. We started to meet up and stencil USPS stickers and would try to think up title ideas in between wearing respirators. Ana came over one day and worked on her Love Aqui hearts. None of the title ideas really worked that day. On the second sticker jam, as I was getting on my bike, I threw out some more title ideas to Todd. “Well, I guess we’ll see if any of them stick.” I paused, and let that last word hang in my brain. “Hmm, how about ‘see if it sticks? '” It sort of connected with Todd, who now had a 25th title idea to mull over. Over the week, I kept mentioning “see if it sticks” to friends. It consistently got chuckles and smiles. I wrote out some punish sentences about sticking stencils and sticky art. Then I realized that Todd and I had made stickers to give away at the show. So…. 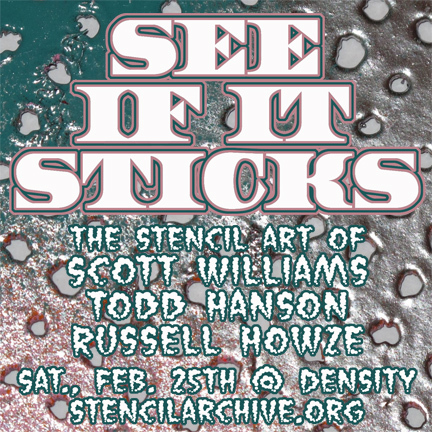 “See If It Sticks” will open Feb. 25 at Density. Still working out the time. You’ll probably find the time on FaceBook anyway! I think we might serve peanut butter and lemon squares. Or possibly honey and crackers. Might as well run the idea in the ground. Oh… the initials of the show – SIIS – sound like a the propelling pigment of a spraypaint can. Previous PostPrevious Special Deals at CELL… Book Now!